On one side, a playful poem celebrating your pup's special traits; on the other, a fetching illustration. 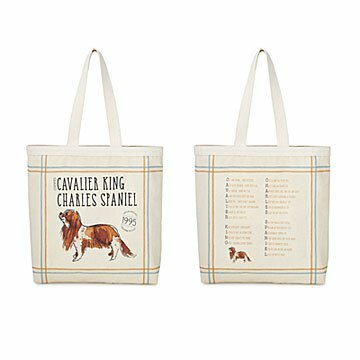 Your four-legged pack member makes you so proud, and this everyday tote features a playful ode that proves it. Each design is unique from head to tail: On one side, a playful acrostic poem celebrating your pup's special traits—from the French Bulldog's "yodel" to the "cavorting escapades" of the Pembroke Welsh Corgi—and on the other, a fetching illustration. Durable with sturdy straps, the bag features a zippered pocket to keep essentials like keys, traditional-sized wallet, and phone easily accessible. Poems by Martin Geller. Illustration by Patricia Carlin. Made in Brooklyn, New York. Click here to see our Pedigree Poem Pillow and Pedigree Poem Art. Airedale Terrier, American Cocker Spaniel, Australian Cattle Dog, and Australian Shepherd here. Basset Hound, Beagle, Belgian Malinois, Bernese Mountain Dog, Bichon Frise, Border Collie, Boston Terrier, Boxer, Brittany, Bulldog, and Bullmastiff here. Cairn Terrier, Cavalier King Charles Spaniel, Chihuahua, Chesapeake Bay Retriever, and Collie here. Dachshund and Doberman Pinscher here. English Cocker Spaniel and English Springer Spaniel here. German Shepherd, German Shorthaired Pointer, Goldendoodle, Golden Retriever, Great Dane, Great Pyrenees and Greyhound here. Labradoodle, Labrador Retriever and Leonberger here. Maltese, Mastiff and Miniature Schnauzer here. Pembroke Welsh Corgi, Poodle, Portuguese Water Dog, and Pug here. Rhodesian Ridgeback and Rottweiler here. Scottish Terrier, Shetland Sheepdog, Shiba Inu, Shih Tzu, Siberian Husky, Soft Coated Wheaten Terrier, and Staffordshire Bull Terrier here. Weimaraner and West Highland White Terrier here. Would you like to suggest a dog breed that doesn't currently have a poem? Email us at breedrequests@uncommongoods.com. If we add it to the selection, we'll let you know! 15" H x 12" W x 2.5" D; interior zipper pocket 7" x 7"
Machine wash cold inside out; hang dry. Lovely bag that was purchased as a gift! This is a really nice tote---sturdy fabric with a zipper pocket inside. It's also very attractive! Worth the money! A gift about dogs to a dog lover. She loves and the dogs know it's about them. Total three pocket pool shot! What a perfect product I have never seen one like it. The only hesitation was the cost. I originally thought it would make a nice shopping bag, but upon inspecting it, I think it will make a better multi-use tote. This bag is great for dog lovers. The poems are unique, creative, and adorable. It looks great! I cannot wait to give it.